Start by whisking the eggs, you can leave a bits of egg whites for the color effect. Add salt & pepper and parsley leaves. I have used the whole leaves without chopping them. Place the baking paper in the large baking tray and pour the eggs in. Bake in preheated oven for 15 min at 200 C or until it gets nice golden color. 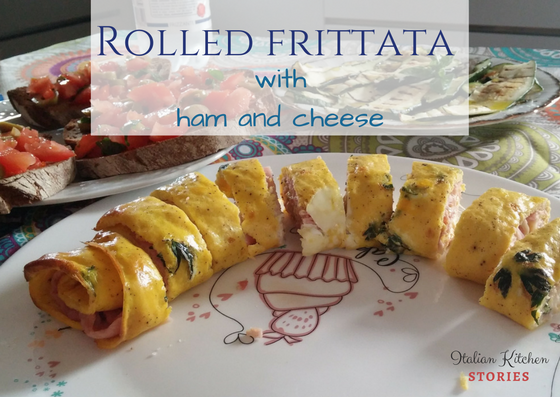 Once its baked, peel the baking paper slowly from the frittata, roll it up and let it rest for 5 min to cool down. Place it on the plastic wrap and unroll. 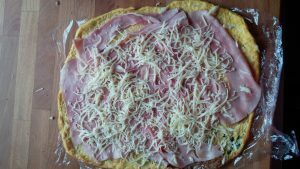 Add the whole slices of ham and grate the cheese on top of it. 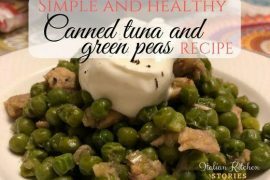 You can use also the whole slices of cheese. I have grated mine in order to melt faster, once I put it back in the oven. 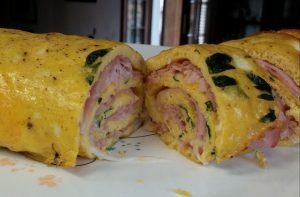 Roll it up again and let it rest for another 3 min. 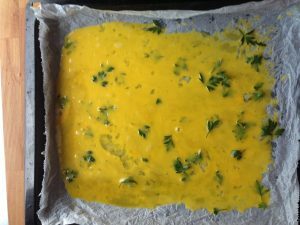 Remove the plastic wrap and place rolled frittata on baking tray and put in in the preheated oven at 200 C for another 5 min at 200C. Cheese will melt and you will get a delicious dish. 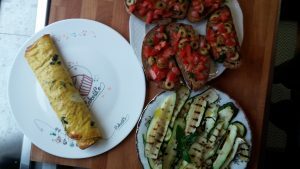 Slice it and serve immediately.I have made some tomatoes and green olives bruschetta’s and grilled zucchini to serve with my rolled frittata.